January: The perfect time to head for the beach. I’ll take gray water and deserted sands near Savannah any old time, and perhaps especially in winter. If Tybee isn’t exactly St. Kitts, it’s still warmer than Atlanta – and it’s all mine. After pensive strolls along the shore, I crawl through the near-empty shops, and head back to a quiet hotel to plow through that stack of books that’s been sitting on my nightstand for months. You can, of course, get too much of a good thing like solitude. And at dinner especially, you want society and sustenance, and the warmth that comes from both. With some coastal eateries closed or on limited winter schedules, you could start feeling a little chilly. But a tiny new restaurant on Wilmington Island, The Red Door, is a good place to join friends and warm your hands over the glow of a nice roasted chipotle pepper. The chef/owner, Michele Jemison, comes by her Southwestern-influenced menu honestly. After culinary school in Vancouver, she plied her trade in the art-and-food-centric Santa Fe scene, at the Galisteo Inn, among others. Her mother, Marie Belisle, is the garrulous hostess; Belisle’s partner, Ray Harvey, sits on a stool near the kitchen, playing a saxophone, occasionally lowering it to sing a plaintive a capella jazz standard. The dining room, with only 23 seats (another 23 will be available this month in a heated, tented deck, Jemison promises), is often filled to the wallboards with the food-savvy doctors and lawyers who first discovered it. The list of entrees is short; the wine list a triple-spaced single page. The descriptions, however, are enough to glue you to your chair: Arugula salad with candied pecans, bosc pears, blue cheese vinaigrette. Mussels in white wine with saffron aioli. Sea bass with lump crab, tomato coulis, fried leeks, and Yukon gold mashed potatoes. Grilled New Zealand lamb chops with pinot noir mashed potatoes, grilled peaches and green beans. I could be here a while, you think, swirling a glass of California sauvignon blanc. Jemison and chef de cuisine Rory Derrigan are visible only in flashes, between puffs of steam from the kitchen. But each dish that arrives in the hands of the experienced waitstaff has the polish and verve of a supremely confident cook. The Mexican shrimp cocktail is authentic, down to the chunks of avocado and serrano chilies, but it’s served bistro-style, in a martini glass. The jumbo lump crab cakes nestle on field greens, heightened by a fiercely flavorful ginger-lemon aioli. Chorizo-and-manchego-cheese-stuffed chicken breast is almost as milky-moist as its sneaky-hot chipotle cream sauce, with baked polenta and petitpan squash. 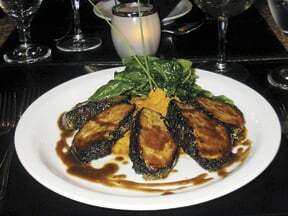 But the dish that left us sockless was coffee-crusted pork loin over sweet potato puree, with a tangle of sauteed Swiss chard. You couldn’t imagine wanting it in high summer, but in cool weather, the sweet-sharp-bitter flavors glowed like coals in my personal pot-bellied stove. Open for dinner only, Wednesday-Saturday, the Red Door is worth the wait. I’ll be back for the $15 prix-fixe Sunday brunch, with goat cheese and smoked salmon frittatas and Georgia-themed French toast strata, with pecans and peaches. Hours: Dinner only, Wed-Sat. Sunday brunch. Dress code: It’s the beach, so almost anything goes, but some dress up a bit for this date destination.